Apart from being a fiscal paradise, the Cayman Islands are actually a great place for a vacation. The islands are, after all, located in the Caribbean, and there are very few unattractive places in the Caribbean. The tropical climate, the fantastic beaches, and the luxury resorts are always appealing to people who would like to disconnect from their everyday life. You can go diving, snorkeling, but the most popular attraction is Stingray City. It is a unique experience in which you can see and even touch stingrays. It would be a pity to miss it if you ever find yourself in the Cayman Islands. Just like any trip overseas, you need to make inquiries about the visa. If you need one or not usually depends on the nationality. However, the Cayman Islands are a British overseas territory, but we cannot talk about a Schengen Area visa. While the United Kingdom is a part of the Schengen Area Agreement, it cannot be said the same about the Cayman Islands. The islands have a visa policy of their own. However, it is more lenient than you think. There are very few restrictions, and most nationalities can go to the Cayman Islands without a visa. The period of time you can spend there, however, can differ depending on the nationality. It varies from 30 days to 6 months. If, however, you need a visa to go to the Cayman Islands, you need to visit the nearest British embassy and apply for a visa there. To find out whether or not you need a visa, you can use iVisa Visa Checker. Just choose your country of origin from the drag-down menu and select the Cayman Islands as your destination. 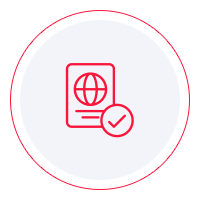 Not only that the tool can tell you whether or not you need a visa, but it can also provide a list the nearest embassies you can use. It is as simple as that. Unfortunately, iVisa does not provide assistance with the Cayman Islands visa application process. Not now, at least. Nevertheless, we still want to help you any way that we can. Our support service is at your disposal 24/7 and is free of charge. When it comes to requirements, our recommendation is to call the embassy or the diplomatic mission you use to apply for your visa. The information you find online may be incomplete or inaccurate, which is why you should use it as a reference only. We can, however, tell you that you need a valid passport that maintains its valid status for at least another 6 months from the date of arrival in the Cayman Islands. We are sorry that we cannot help you even more. As soon as electronic visas become available for the Cayman Islands, we will do our best to provide a short and straightforward visa application process. Until then, we hope that the process you undergo at the embassy is smooth and does not take too much of your time and energy. Other than that, we wish you a lovely vacation in the Cayman Islands.